There are lichens growing on my tree. Is this going to harm the tree? Does this mean that my tree is dying? I’ve been thinking about this lately as I’ve been noticing some of the interesting lichens growing on our own trees, including some of our mature fruit trees. 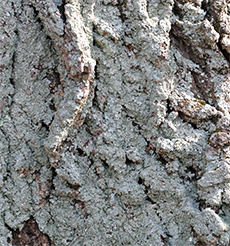 The simple answer to the question is no, lichens do not harm your trees – they are just using them as a substrate to grow on. They also grow on rocks, gravestones, soil, and the outside walls and roofs of buildings. Lichens are rather complex life forms. They are not a single organism but actually a combination of two separate organisms; the mycobiont which is a fungus and the photobiont which is either a species of green algae, a cyanobacterium (blue-green bacteria, previously called blue-green algae), or sometimes both of them together. These two organisms, the mycobiont and the photobiont, coexist in a symbiotic relationship each benefiting from the other in order to survive. The fungus, which surrounds the algae cells, provides protection to the cells and keeps them in a moist environment (most of the time). The algal/cyanobacterial component which contains chlorophyll produces food for the fungus through photosynthesis. If a cyanobacterium is part of the “lichen package”, it can also fix atmospheric nitrogen converting it to a form that can be used by the lichen. 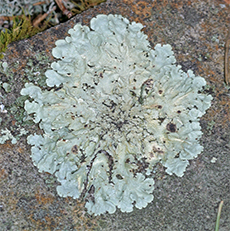 When it rains or when the lichen dies, this important nutrient leaches into the soil and becomes available to other plant life in the surrounding area. rocks, rock walls, even gravestones. So, as you can see, lichens are pretty self-sufficient. They are not parasitic organisms; they do not “feed” upon the substrate they are attached to. They don’t have roots; they attach to the substrate via nonvascular fungal filaments. Lichens derive everything they need to survive from the atmosphere. 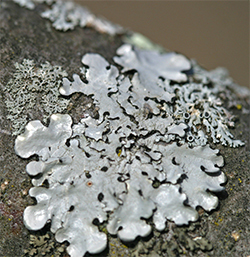 The fungal component of the lichen is by far the more prominent partner and gives the lichen its shape and structure. With its larger surface area, the fungus is able to “collect” water and mineral elements from the air. Some species that grow on rocks can eventually over a very long time slowly through both mechanical and chemical means break the rock substrate down, gradually turning it into a mineral soil. 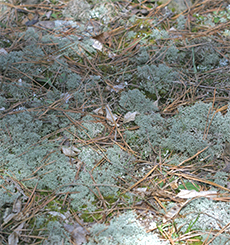 A ground cover of reindeer “moss”. Lichens are famous for their ability to survive in very harsh environments; from the frigid arctic tundra to blistering hot, arid deserts. They are able to withstand prolonged periods of desiccation during which they dry out completely and become very brittle. If pieces of these brittle lichens break off and land in a favorable location, they can create new lichens. When moisture becomes available again, through rain, mist, fog, or even just humidity, the fungal partner quickly absorbs water, rehydrates, and becomes chemically functional again. 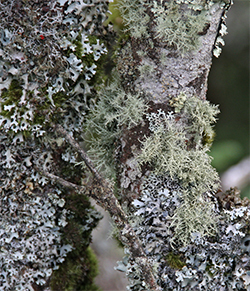 There are tens of thousands of different species of lichen but most can be grouped into four basic growth forms; foliose, crustose, fruticose, and squamulose. The first three of these are the ones I have seen most. Foliose lichen, as the name implies, is rather leafy in appearance. They grow flat on the substrate but are not tightly attached. These are the ones I mainly find on my trees. Crustose lichen is very flat and is tightly attached to its substrate. These are often found on rocks. 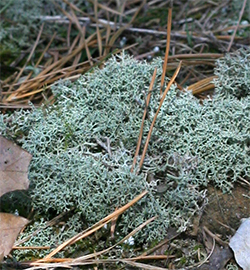 Fruticose lichens are more three dimensional and are usually attached to the substrate at a single point. Reindeer “moss” (which grows on the ground) and “old man’s beard” (which hangs from trees) are familiar types of fruticose lichens. Many species of lichen are important food sources for a variety of different animals from large mammals like reindeer and caribou to smaller mammals like voles and flying squirrels. In addition, some species of the more upright fruticose forms provide both shelter and nesting material for many birds, small mammals, and a variety of insects. including both foliose and fruticose forms. Lichens are very sensitive to air pollution and grow well only when the air is clean and unpolluted. If air quality declines due to pollution, especially from sulfur dioxide, lichen populations will begin to decline. In fact, many studies use lichen growth as a bio-indicator of pollution levels and trends. So if you have lichen growing on your trees, rock walls, and other places in your garden, consider yourself lucky! This probably means you have nice clean air to breathe and you can rest assured that these fascinating symbiotic organisms are not harming your plants or causing their demise – they are just “hanging out”, basking in your pure air and soaking up a bit of your sunshine and rainwater! 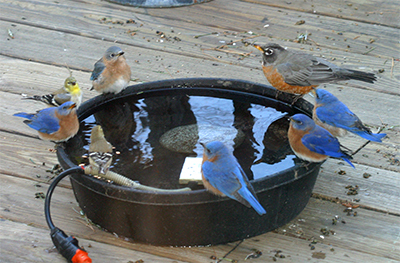 Bluebirds and a female yellow-bellied sapsucker drink at the water trough. Last Saturday morning, I got our leftover vegetable seeds out to take inventory and see what we might need for this season. Actually, sometimes it’s not so much that we NEED something, but that we’ve found some cool new (at least to us) varieties that we want to try. It’s always fun to thumb through all the seed catalogs that we get each winter to see what’s new and different. 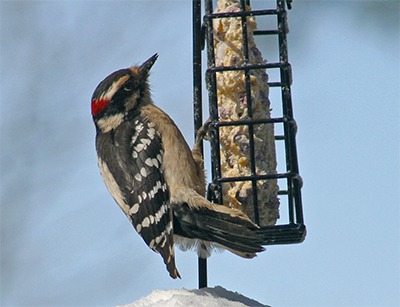 crook before heading to the suet feeder. We were doing this (as always) over our morning coffee in front of the fire in the sunroom. One wall of our sunroom is made up of double sliding glass doors that overlook the deck with all our bird feeders and we enjoy sitting in here on weekend mornings so we can watch the birds. 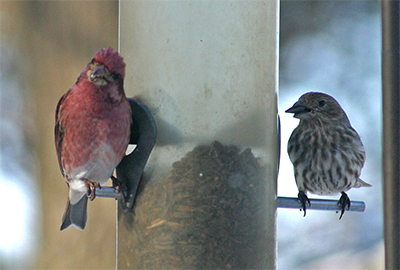 This particular morning there was quite an interesting diversity of birds at the feeders. 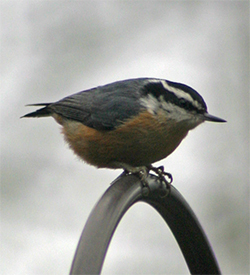 There were the usual chickadees, titmice, and finches; but also some woodpeckers and my favorite little red-breasted nuthatch. The cute little Carolina wrens were around, too. A big red-bellied woodpecker came for a visit and spent some time at the Droll Yankee feeder that was filled with sunflower “Meaties” (thanks, Mom!) 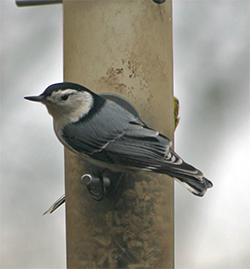 and also at one of the suet feeders. He disappeared as soon as I got my camera – figures! Anyway, as I was going through our leftover vegetable seeds, I started throwing out some of the older seed because I didn’t want to risk having germination problems. I’ve had my share of those over the years and it’s very discouraging. I feel like it’s a waste of time and energy – things that most of us don’t have any extra to spare! A tufted titmouse with a sunflower seed eyes some of the seeds on the railing. Eric suggested that instead of throwing the seed out, we should try putting some of the untreated vegetable seeds out for the birds to see if they would be interested in them. He spread some of the seeds out on the deck railing so we could see whether anyone would eat them. We did see a few birds peck at them but they were much more interested in the sunflower seed. I don’t think even the squirrels seemed interested and after a while most of the seeds blew off the railing and ended up on the deck or in the flower bed below. Hmmm – maybe we will have a lettuce and carrot garden in amongst our lacecap hydrangeas and peas growing up the deck posts! Yesterday morning, the turkeys were back but this time they came out of the woods and were wandering around on the lawn. 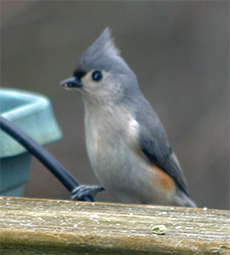 Some of them ventured up under the deck and were pecking at the bird seed that had fallen to the ground from the feeders. Maybe they were also eating some of the old vegetable seeds that had blown off the deck! 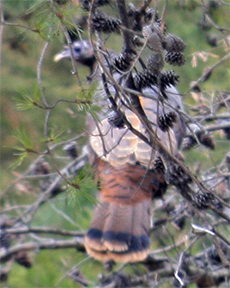 A female turkey perches in a dead pine. I watched them for quite a while. They are fascinating creatures – so big! They seemed to be a bit more active than they had been before; running around, chasing each other, and flapping their wings. All the males that I saw in the flock seemed to be juveniles (jakes) because they are just beginning to grow their beards and had very short leg spurs. Some of the hens flew up into the pine trees and perched there awkwardly, trying to balance themselves on the branches which were bouncing under their weight. It was so odd to see such huge birds sitting in a tree. This flock of turkeys seems to be sticking around – I’ve seen them a lot lately and they were up scratching around in the woods again this morning. 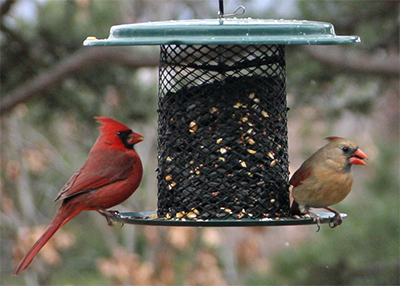 Take a little time to enjoy your wild bird friends this winter! 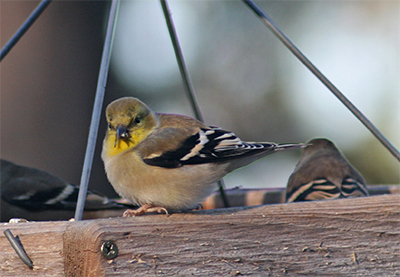 Just remember, keep your feeders full and don’t forget to provide them with a source of fresh water. I’m convinced that the water is what brings a lot of the birds in to our feeders – especially the bluebirds and the cedar waxwings. When it’s really cold out, it can be difficult for them to find a source of unfrozen water. Until next time – Happy Birding! 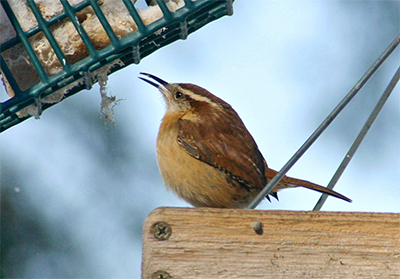 A Carolina wren picks at suet from the platform feeder. Everyone enjoys a drink at the “watering hole”! Soil: The “Below-Ground” Plant Environment! growing environment for your plants. In not too long, we will all be itching to get out in our vegetable and flower gardens to start the planting season. But, since it is way too early for most of us to even think about working in the soil, I thought I would take this opportunity to talk ABOUT soil. Because it is so important to the health and well-being of your plants, it should become very important to you as a gardener. Awareness of the properties of your garden soil will allow you to adapt your cultural practices so your soil environment will be most conducive to healthy plant growth. 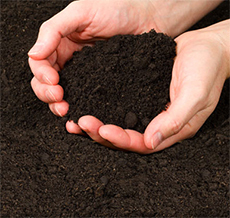 Mineral soils, the most common soil type, are classified by particle size – clay, silt, and sand. 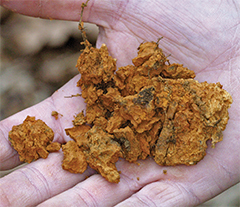 The soil texture is the relative percentages of these different sized particles in your soil. In most soils, one of these particle sizes predominates and this is used to classify the soil. 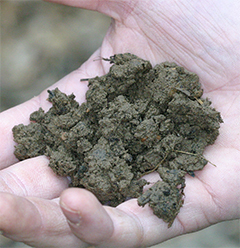 Since silt is usually present in small quantities, most soil is classified as either sandy (largest particle size) or clay (smallest particle size). What can you do to improve your soil? organic matter to the soil. There are many different forms of organic matter that can be added to your soil to help improve its texture and structure. Good quality compost, such as Blue Ridge Organics “Super Compost”, can be found pre-packaged in large bags at your local garden center. Good organic material can also be brought in by the truckload or you can make it yourself by creating a compost bin or by shredding your fall leaves. 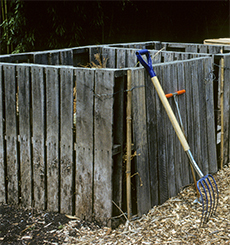 In many towns and cities, composted leaves are available free of charge or for a nominal fee – you might just have to call and arrange to pick it up. 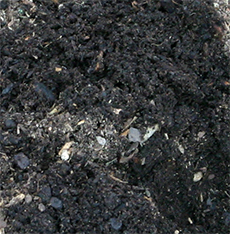 Other forms of organic matter to enrich your soil are: leaf mold, peat moss, composted manure, composted hay or grass clippings, green manure (a cover crop such as alfalfa that is tilled under in spring), and finely shredded bark mulch. “Hey! There are a bunch of wild turkeys walking up the driveway,” Eric called from the kitchen Sunday morning as he was making breakfast. the breeding season in spring. Cool! The turkeys are back! I hadn’t seen any in our woods for a couple of years so I was pretty excited to see some around again. When I went to look, I saw quite a few on the driveway and even more in the woods. The more I looked, the more I saw. There must have been at least 20 turkeys milling around. It was really exciting to see them. 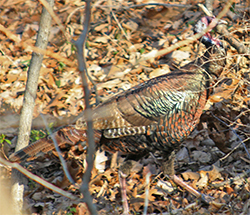 Most of the turkeys were up in the woods scratching around in the dry leaves on the ground just like the large flock I saw in my parent’s woods up in Vermont. I’m sure they were hunting for acorns to eat. In Vermont, it was the beechnuts they were after but in our Virginia woods, acorns make up a lot of their diet – and boy, do we have acorns! We had a good acorn crop last fall. 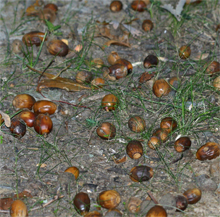 We had a good mast crop last fall with loads of acorns and hickory nuts falling to the ground. It was interesting to watch the turkeys flicking leaves up in the air in search of the acorns that were buried under them. 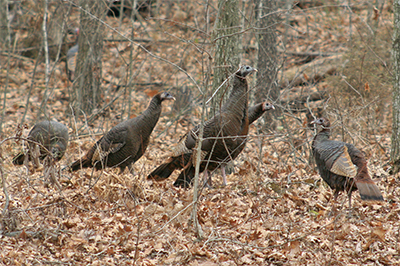 When I was in Vermont last fall, we saw several large flocks of turkeys foraging in corn fields that had been harvested. I’m sure they were scavenging for corn seed that had dropped to the ground during the harvest. This makes an easy meal for them. Good thing it was after turkey season (and after Thanksgiving) or they would have been easy pickin’s for someone’s Sunday dinner! We watched our turkeys for quite a long time. Breakfast was put on hold for a while as Eric got his camera and telephoto lens and started taking pictures. It was hard to get good shots though because he was shooting through the window but I’m quite certain that they would have run off if we had ventured outside to take pictures. 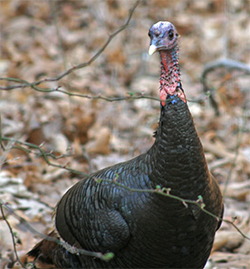 Turkeys may not be the most attractive birds in the world but they certainly do have beautiful plumage. When the sunlight hit the feathers of the big toms, they were very iridescent; sometimes reflecting a shimmering bronze and other times flashing red, green, or even blue depending on where and how the light hit them and how their feathers were fluffed. Very cool! Their heads kind of ruin the effect though, being featherless and gnarly with all kinds of protuberances sticking out all over – especially the males. But, I suppose beauty is in the eyes of the beholder – the hens must see them differently! Eventually we got our breakfast but those turkeys ended up spending the whole morning and part of the afternoon foraging in our woods. They must have found the mother lode of acorns and other delicacies out there! 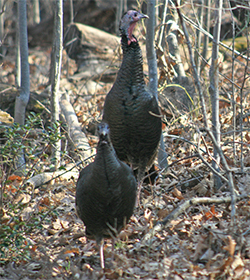 I saw four turkeys in the woods on Monday morning but haven’t seen any since then. I hope we see them again at mating time which usually starts around March. It would be really neat to be able to hear the toms gobbling to attract the hens and then see them strut around all puffed up with their tail feathers beautifully fanned out during their courtship ritual in their attempt to persuade the females that they are the top banana. I’ve never heard a wild turkey gobble but I’ve read that you can hear the call up to a mile away! Fascinating!